Just a short post for today. One Monthly Goal (OMG) has been going since January, but this is my first time participating. 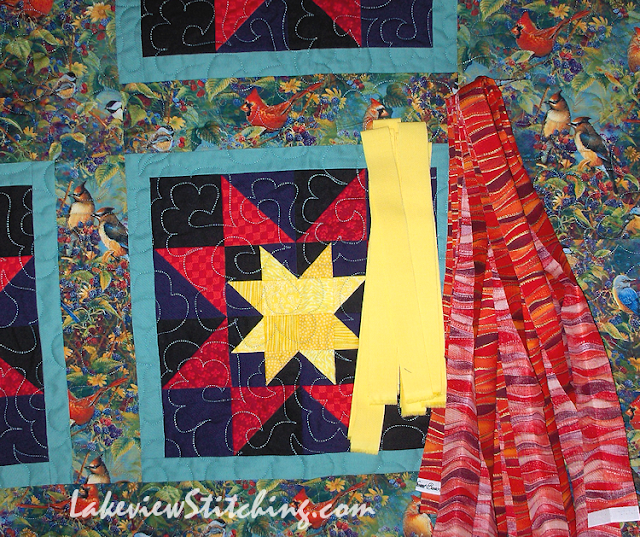 This month I really want to get the binding sewn onto my Cardinal Stars quilt. I quilted it six months ago, and it has been languishing because a) summer is too hot to sit with a big quilt in my lap, and b) I want to make a fancy two-colour binding, and I haven't been 100% sure of how I want to do it. Check out all the other goal-setters at the October link up, right here. ooolala, I love that binding fabric! That would have disappeared right into another project around here. If you are like me, it is a good thing you cut and saved it with the top! Really, it is so sweet with the cardinals, and with the yellow accent as well, can't wait to see! The OMG is a great idea! I know all about quilts languishing. 😂Your color choices are great. Thanks, Terry! I have a plan, so let's hope it works out! That cardinal sashing is perfect with the blocks. I LOVE the fabric you chose for the binding. I can't wait to see the finished quilt. Have fun. Thanks, Kathi! I'll be holding my breath to keep that bright yellow straight, but it will feel great if it works! OMG, you are a seriously productive and organized woman these days. Ans as always, your fabric choices are right on. Thank you! Let's hope so! OMG seems a good way to focus on getting projects completed. Good luck on this one - though it looks like you should achieve it pretty easily.